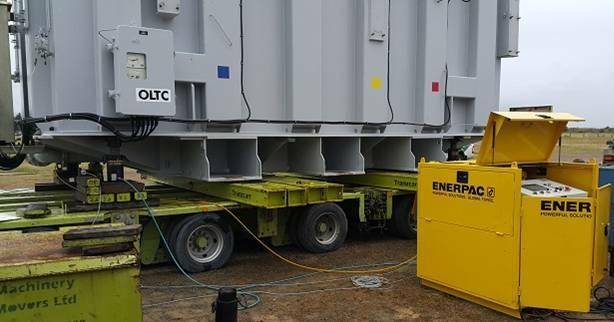 An Enerpac EVO synchronous lifting system has helped save a transformer manufacturer hundreds of thousands of dollars in freight from New Zealand to India by safely and precisely weighing the electrical equipment to exactly verify that its tonnage came in under local shipping port weight limits. The hydraulic 12-point lifting, shifting and weighing system was deployed by New Zealand and international logistics and machinery moving specialists Machinery Movers Ltd to assist with their delicate challenge in Northland, New Zealand. Machinery Movers needed to establish that the transformer came within the Northland Port’s maximum lifting capacity of 110 tons. If it exceeded this, a special ship had to be brought in at a cost of many hundreds of thousands of dollars, says Enerpac New Zealand representative Mr Neville Stuart. The 12-point Enerpac synchronous lifting system used in the Machinery Movers project is of a type that replaces manual control of hydraulic heavy lifting with Programmable Logic Control (PLC) control of multiple hydraulic cylinders, a technology that offers accuracy, safety and productivity benefits for precision lifting, shifting and weighing of heavy machinery, plant and structures. Using the EVO system, one operator controls the entire precision lift, shift or weighing process, during which the status of every hydraulic lifting or pulling point is constantly monitored and displayed. Instead of whole teams of lift and shift personnel trying to manually co-ordinate with each other inputs/outputs from hydraulic cylinders dispersed around a job, the EVO-Series Synchronous Lifting System integrates the high-pressure hydraulic cylinders involved with the PLC system to monitor and control precise movement, positioning and weighing of heavy loads. “Quite often, as in maritime construction and shipping operations, you have to get an exact idea of the weight at each lifting point as well as the total weight so as to get an even spread of power and precise totals. Through an integrated HMI (Human Machine Interface), all of the EVO system movements are managed from a central control position that displays live operation with real-time status updates for each lifting position. The EVO system is the evolutionary result of Enerpac’s 25 years of experience in specialised hydraulic engineering and lifting technology using digitally controlled hydraulics. Enerpac’s global synchronous lifting experience strongly complements the expertise of Machinery Movers, which provides a full range logistics packages including consultancy and engineering services from initial planning through all stages to project completion. The company’s expertise extends from small factory plant and machinery removal through to handling major weight-intensive and over-dimensional projects. In addition to buildings and stadiums, Enerpac synchronous systems can be readily applied to infrastructure such as bridges and tunnels and for monitoring, foundation support and structural testing. Similar systems have recently been deployed in Australasia to lift, shift and position drilling rigs, wharf cranes and (using a related SyncHoist technology) to lift, shift and position complex and heavy precast concrete girders involved new $72 million Brisbane Riverwalk project.